Fly curtains hold a very special place in my heart. No regularly open door in Italy is without them, and it was through them that I first learned to view the world. When strange guests came calling, and in large Italian families there are many strange guests that you are urged to kiss and who pinch your cheeks until they glow cherry-red, I would hide amongst the strip-y stripes of fly curtain, chewing on them. As I grew older, I would spy on boys on motorini through them. I all-seeing whilst remaining totally invisible to them. The plastic strips would also make great fly swats. So you see, fly curtains are incredibly romantic. Not boy-romantic, but life-romantic. I like the way the sunlight diffuses through them. But mostly of course, I like the way the flies stay out. Now, Italy is big on brightly coloured fly curtains made of semi-opaque, fairly hard (hence why they make good fly swats) strips. A bit like strips of hanging boiled sweets. Nice in Naples, where Farrow and Ball hasn’t visited yet, but in my house: no. I didn’t even really think they were necessary in this country until I got me a back door (glass, stable) which is nearly always open during fly-season. I.e. now. I started looking for a fly curtain that wasn’t awful. It wasn’t easy. The most stylish I could find was by a German company using silver link chain. But even that wasn’t great and cost £100. 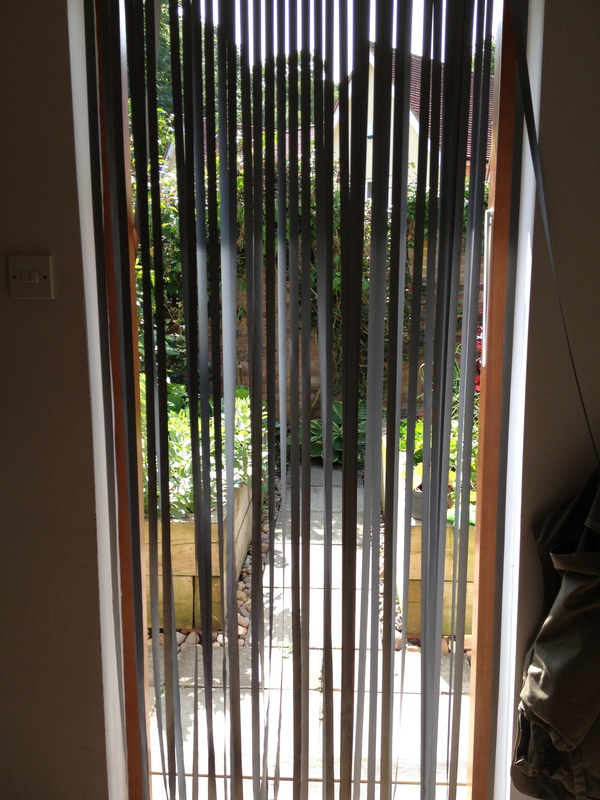 Then I went to a friend’s barbecue and she had this great matt grey fly curtain. If Kelly Hoppen had a fly curtain it’d be this one. I did some research and tracked it down and ordered one too. Officially it’s called the Silver Slat Blind. I got mine custom made as our back door isn’t a standard size. It looks great. The service was unbelievably superb – I struck up a correspondence with someone called Sue who was incredibly helpful – and I paid about £8.50 for it all in. I recommend it all highly. All from Holland Plastics. 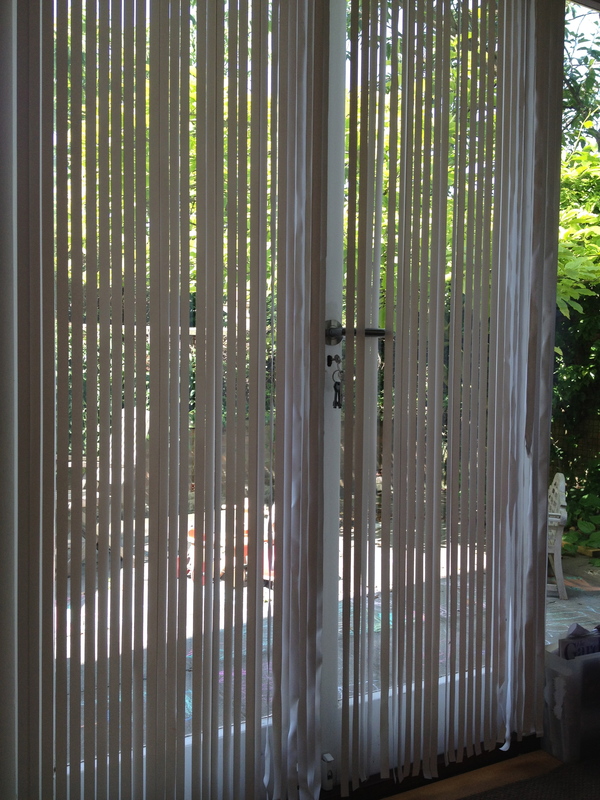 The first picture is of a double white fly curtain for the terrace doors (the terrace, dahlink!). The second pic is of the original grey one. This entry was posted in Consumer on May 24, 2010 by Annalisa Barbieri. When I used to write travel pieces, people used to ask “do you have a secret place that only you know about?”. And I’d lie a little and say “no”. The lie was only a little lie, in that, obviously I wasn’t the only one to know about my special cottage. But there was no way I was going to write about it and splash it across the papers so it could get booked up and then there’d be no room for me. This has happened to me before. Many years ago I wrote about the Rasul Mud experience at the Elemis Day spa. This was a totally affordable little treat for two people and I never had any problems booking it. Then I wrote and raved about it and not only was there a six month waiting list but the price rocketed, completely pricing me out. Don’t even get me started on the MaltEaster bunny shortage this year which I think is entirely due to me writing about them because of course I like to think that I am that important that I can trigger such an event. When I first started going out with my boyfy-husband (boyfband? husfriend? ), thirteen years ago, he introduced me to this cottage in Devon, just minutes from Dartmoor. It took me a few days to realise how completely special this place was. At the time, I was pretty entrenched in five star hotels (through work) and being flown first or business class. Even though I didn’t live like this at all, going away meant a certain amount of luxe. This cottage isn’t really about that. Parts of it are a bit ramshackle. But God is it wonderful. For one, it’s down a tiny lane so it’s completely secluded. I’m talking peace and quiet like you got in the 1950’s. You can’t hear any traffic at all. But it’s not secluded because the people (lovely, lovey people that are there if you need them but not if you don’t) that own it live opposite. Children can play in the courty-yardy bit at the front. The gardens are spectacular. And there is a – walled – vegetable garden of about an acre that is the finest I’ve ever seen (and I talk as someone who has been to lots of National Trust places). So why am I mentioning it now? Well the whole place is for sale. I don’t want it to be sold. We’ve had the most special holidays there ever. Our eldest loves it. It’s got a sort of magic about it even when it’s raining. The thought that we might never be able to go there again (we went at Easter this year) or that our youngest won’t remember it, makes me sad. But the owners are “getting old” (their words not mine) and it’s a big place to look after. So it’s very likely this will be the last year you can ever stay there and well, I thought I should be generous. There is tons to do when you get there. Dartmoor, magnificent, moody, dangerous, is not far at all. Then there are wonderful villages to explore: Chagford, Lustleigh..I will write more about these another time because Chagford contains one of my favourite shops ever. And there’s Castle Drogo nearby which is my favourite NT property of all time. 2012 Update: The property was eventually sold. To the National Trust. This makes sense as it owns Buckland Abbey next door but I’m sad it didn’t sell to a wonderful family who could enjoy this. But, the good news is that the house and two cottages, at least inasfar as I know, will be refurbished and anyone will be able to stay there. We used to stay at Tower cottage which isn’t yet up for rent, but this one is, Cider Cottage next door. We never stayed there as it was always rented out on a long-let but it’s right next door to where we did used to stay and I’m sure it’s fabulous. This entry was posted in Consumer on May 18, 2010 by Annalisa Barbieri.